What won’t you find in M&B? You won’t find reviews of shoes, apparel, or equipment; lists of upcoming races or race reports. Not because we don’t think such material is important, but because other magazines and many Internet sites do a fine job of providing this material. 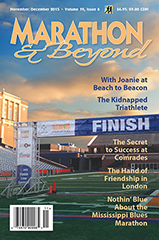 Because M&B focuses on long-distance running, you won’t have to wade through pages and pages of articles for casual runners before you find a juicy morsel for marathoners and ultrarunners. It’s our goal to go beyond what other running magazines are doing, to give you extensive coverage of topics that are unique to long-distance running.